Egyptian bakers are threatening strike action unless the government meets demands including back-payment of financial incentives, raising the prospect of fresh unrest in the crisis-ridden north African country. Abdullah Ghorab, head of the bakers' association which represents 25,000 private bakeries across the country, said imminent strike action has been postponed following a meeting with the government. The association gave the government 15 days to meet its demands. Any shortage of bread in Egypt would likely touch off unrest as the government grapples with an economic crisis rooted in two years of political turmoil. The heavily-indebted state faces a deficit that will hit 12.3 percent of GDP in the year to the end of June unless economic reforms are implemented. A country of 84 million, Egypt is the biggest importer of wheat in the world. The state has long subsidised bread production, with the cheapest loaves selling for 5 piastres, or less than 1 U.S. cent. Bank sources on Wednesday said funding problems were forcing Egypt to consider abandoning its regular public tenders that have been a centrepiece of world grain trade for decades. Egypt normally buys strategically to ensure it has wheat stocks equal to at least six months' consumption in its silos. By contrast, the government said on Wednesday that it has stocks to last until May 29, or just three months. Ghorab said the 25,000 privately-run bakeries represented in his association include 19,000 that produce 5-piastre loaves, and 6,000 more that produce 20 piastre loaves. The state operates another 107 bakeries, he added. 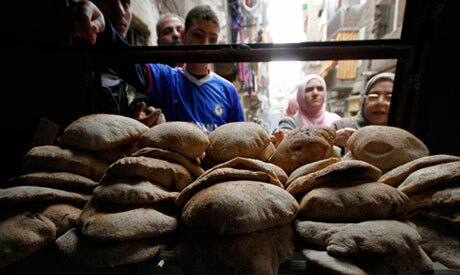 Ghorab said the government owed bakeries 400 million Egyptian pounds ($59.34 million) in payments dating back six months. The payments cover an incentive paid to bakers to produce low-price loaves and an extra subsidy to cover higher fuel prices. "The head of the government and the supply minister came to us and promised that within 15 days they would meet the demands of the owners of the bakeries," Ghorab said. Egypt's economy, once strong and popular among investors, has been in tatters since the revolt of 2011 that ousted Hosni Mubarak and shook the country to its foundations. Foreign reserves are dwindling and the pound has been battered lower. Food and raw materials from abroad have become more expensive, hurting businesses and families in a desert nation which relies on imports to feed itself. Egypt suffered bread riots in 1977 when the state tried to curb subsidies, and a dive in the pound in 2003 forced up the food subsidy bill by 40 percent. Riots erupted again in 2008 over high food prices and low wages.